Hiding in plain sight. Why is that a phrase we use? How is that possible? We typically think of "hiding" as involving a shroud, a cloak, or a barrier that covers the hidden person or thing. Yet there are times when our minds, for whatever reason, can be blinded from seeing something directly in front of us. This can occur physically, like when you are looking for your keys and they are literally on the desk in front of you. The vision center of your brain just isn't processing their presence and sending the signal to your prefrontal cortex. Thus, you don't see them. It can also happen metaphorically, when the answer to a question or the person we are looking for is right there in our life, yet we keep searching. This is where I'm going with this post. While it is frustrating to look for something and not find it, it's perhaps more infuriating to find out it was there all along, but you missed it. Why do I insert a picture of a sunset here? Let's try to put the pieces together. So often we search for peace and tranquility in our fasted-paced lives. We schedule massages and therapy sessions to release our tension; yet what if what we need is staring us right in the face every day? I'm not against masseuses and therapists, but I am against missing out on benefits. Every day the sun rises and sets in our part of the world. It bombards the earth with its beautiful light, which is refracted and reflected by the abundant atmospheric content of our planet. The result is a breathtaking reminder that we ought to be looking upward for our Peace. Marketing has always used attractive things to draw our attention toward a product. I believe God uses a similar marketing approach to get our attention. He displays His beauty, majesty, and glory throughout the entire Earth for people to see. He wishes for us to stare, the stand in awe, and to contemplate the vastness of our world. Don't rush past it. Don't ignore it for sake of your frustration--let it ease your frustration and calm your spirit. We ought to gaze at the moon and stars, wonder at the mighty storms, and consider the waves of the billowing ocean when they are in front of us. These are the advertisements of God. Does marketing work? Sure it does. It's never 100% effective, but even a seemingly dismal percentage can mean big business for a company. God knows that most people will not take the time to read His signs, but those who are searching will. God repeatedly says in the Bible that "those that seek Him" are the same people that will find Him. He is not a politician that will call your house four times a day to harass you into acknowledging Him. He's too classy for that. He loves us, but He does not need us. Consider this parable from the Bible, then we can apply it to this discussion. 24 Another parable put he [Jesus] forth unto them saying, The kingdom of heaven is likened unto a man who sowed good seed in his field. 25 But while men slept, his enemy came and sowed tares [weeds] among the wheat, and went his way. 26 But when the blade was sprung up, and brought forth fruit, then appeared the tares also. 27 So the servants of the householder came and said unto him, Sir, did you not sow good seed in your field? From whence then hath it tares? 28 He said unto them, An enemy hath done this. The servants said unto him, Do you want us to go and gather the tares up? 29 But he said, Nay; lest while you gather up the tares, you root up also the wheat with them. 30 Let both grow together until the harvest: and in the time of harvest I will say to the reapers, Gather together first the tares, and bind them in bundles to burn them; but gather the wheat into my barn. God has always known there would be people who would hate him and would not seek Him. In His economy, these individuals have sealed their own fate--a fact that makes Him very upset (II Peter 3:9). Thus, He has chosen a way to reveal Himself to those who would love Him and to conceal Himself from those who want to hate Him because of their own self-reliance and pride. One of the ways He accomplishes this is by hiding Himself in plain sight. He is everywhere. His fingerprints permeate Creation, from the complexity of electron energy states within atoms, to the fascinatingly coded levels of information embedded within the nucleic acid and protein polymers of living organisms. His personality is here for the wheat to see and the tares to ignore. You get to decide which you will be. 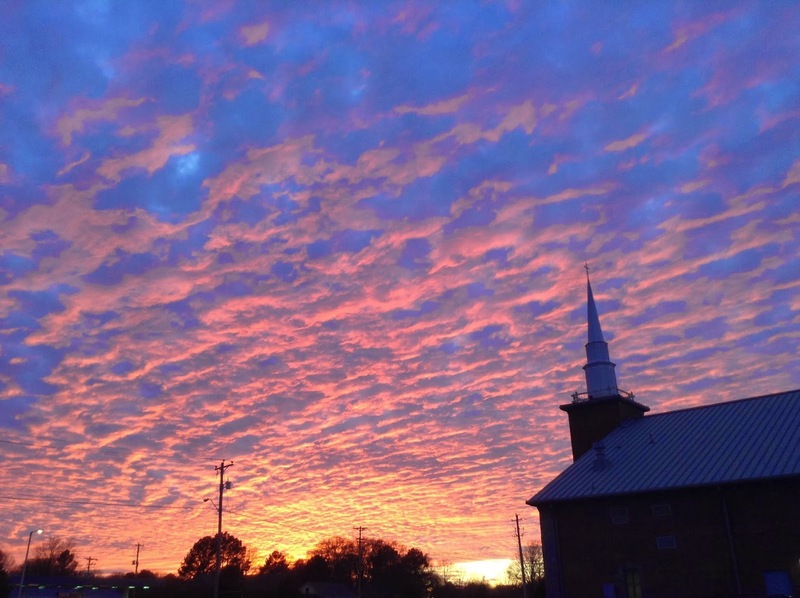 Sunset photo taken by Daniel J. Devine on January 26th, 2014 in Bartlett, TN.